More cautious customers in financial services, health and government would typically have been slow to adopt a new OS, sometimes waiting years. “However, those are also the very same customers that are the most security conscious, and this time around we’ve seen a big difference," Dewar added. "What would previously have been laggard customers are moving as fast as the early adopters, because the security posture that comes with Windows 10 and the capabilities they’re interested in require them to move, and they’ve got a real desire to go after that better security posture." That includes organisations like Adventist Health, which has 80,000 employees in 46 hospitals in 10 states. Adventist upgraded a quarter of its 55,000 Windows 7 devices to Windows 10 last year and expects to migrate the rest by the end of 2017. 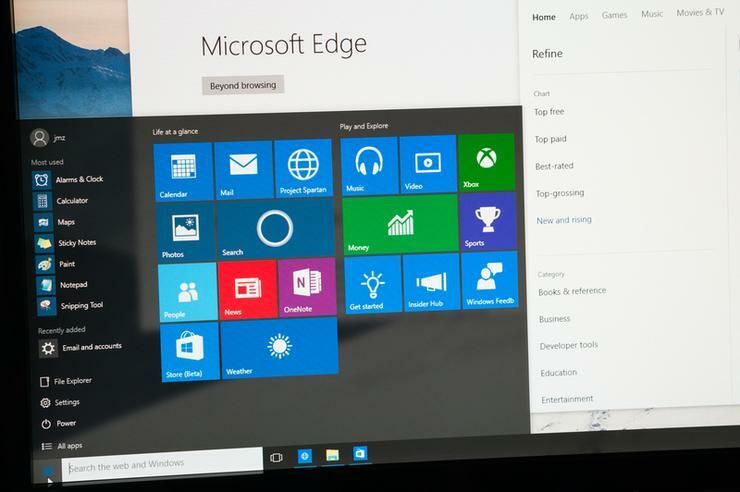 “Their driver for moving [to Windows 10] is security, and they also have some mobile use cases. Historically they’ve not moved very quickly, because of concerns around app compatibility," Dewar explained. "Across their different departments, they have hundreds and hundreds of very specialised medical apps they use. "Moving from Windows 7 to 10, they haven’t run into any application compatibility issues, despite the fact that they thought they would, and so they’ve been able to accelerate their adoption." Mars is another large customer whose migration to Windows 10 went faster than expected. “They originally planned to roll out to about 5,000 employees in the first year,” Dewar said. “They’d factored in the time they thought they’d need for app compatibility and other things but that turned out to be unnecessary. "They got 12,000 people deployed in the time they’d planned for 5,000, and they’ll be finishing all 80,000 staff by the end of this year." This accelerated adoption is possible partly because all the remediation organizations had to do to upgrade to Windows 7 smoothed the way for Windows 10, but Microsoft has also worked on the tools IT departments need to manage deployment. “In the first year, if we saw any blockers coming up, we took them off the table," Dewar added. "With the first update, some customers using third party disk encryption couldn’t do an in-place upgrade because our setup code couldn’t read the disk." Creators Update can also automatically enable UEFI capabilities on PCs that have the right hardware but were using legacy BIOS for Windows 7. “If you want some of the advanced capabilities in Windows 10, like Device Guard, things enterprises really want for security, you need to be running the UEFI BIOS,” Dewar explained. Enterprises also benefit from the consumers who took the free Windows 10 upgrade, Dewar added. That information powers the Windows Analytics cloud service that enterprises can use to plan upgrades. 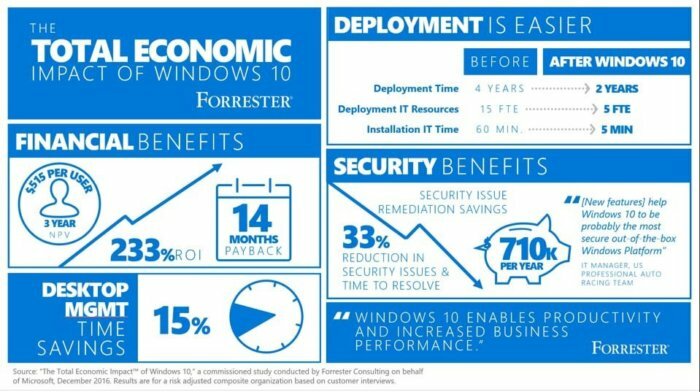 In-place upgrades that used to take 60 minutes of IT time take only 5 minutes, he said, which is one of the main reasons Forrester gives Windows 10 such a high ROI in the most recent Total Economic Impact study commissioned by Microsoft. The Forrester study also showed that Windows 10 takes 20 per cent less IT time to manage and gives mobile workers a 25 percent improvement in productivity — and it does deliver the security improvements enterprises need, thanks to features like Device Guard and Credential Guard. “They see about a third fewer security related issues that they have to follow up on,” Dewar added.